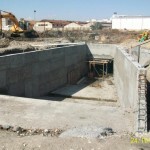 estimated at 1.1 million m3. 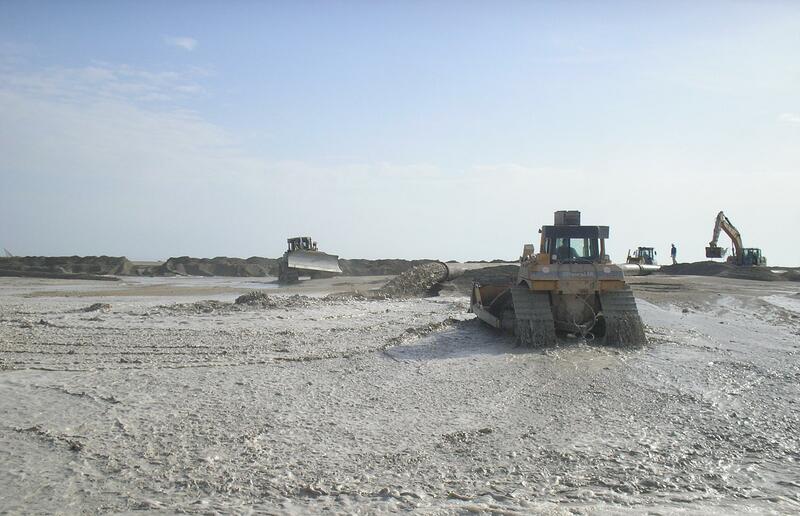 The spatial and vertical area of the phosphogypsum plate was determined and confirmed by the company before starting the excavation works. 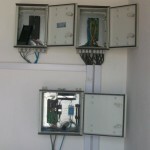 These works were carried out by SOMATRA / GET Company. 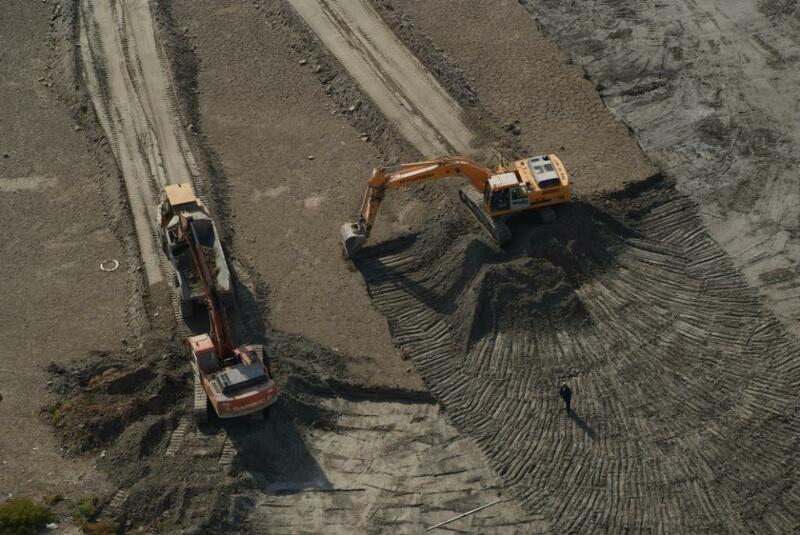 The excavation of the plate is carried out through isolated compartments. 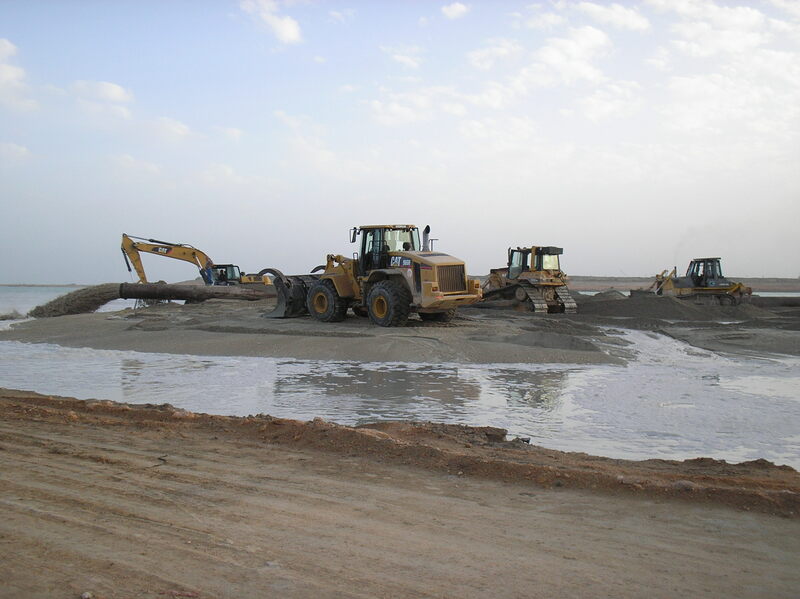 In this way, it is easier to pump the inland waters and the non-excavated limits enable access from one area of the site to another. 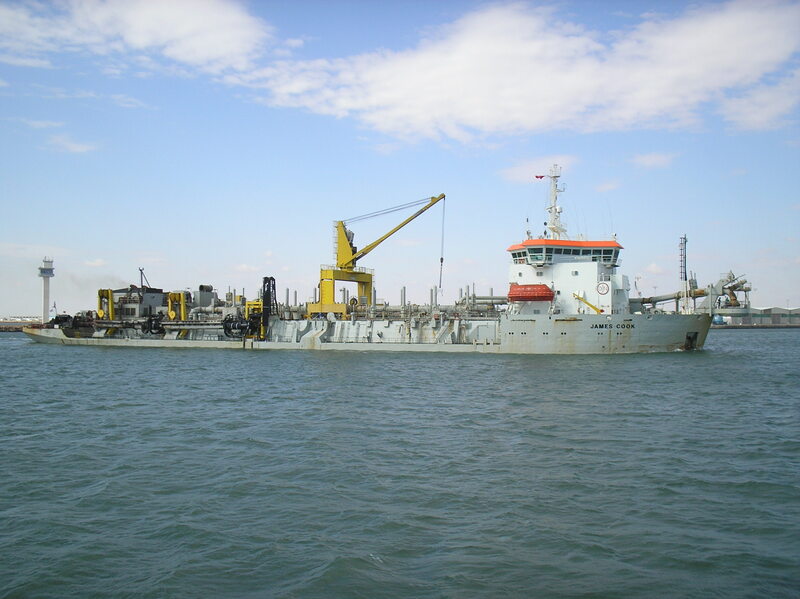 Under water excavation works were carried out ​​by JAN DE NUL Company specializing in maritime works. 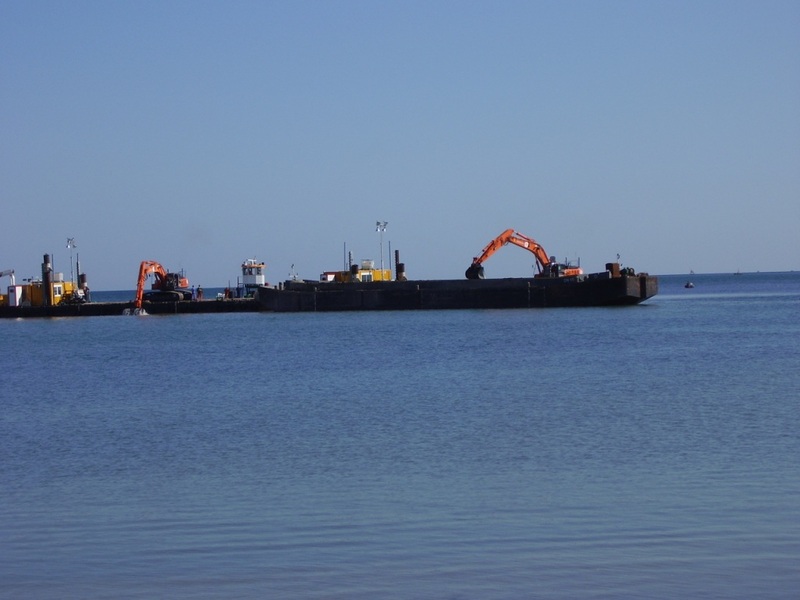 The used material consists in two stations each consisting of a backhoe mounted on a pier and a barge. 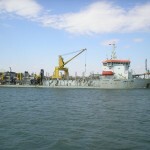 The barges are moved by means of a tug. 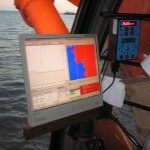 The backhoes are equipped with sophisticated and precise computer systems for the follow-up of underwater excavation operations of contaminated materials. 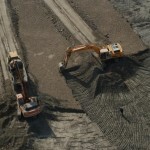 Besides, these backhoes are equipped with a high performance positioning system. 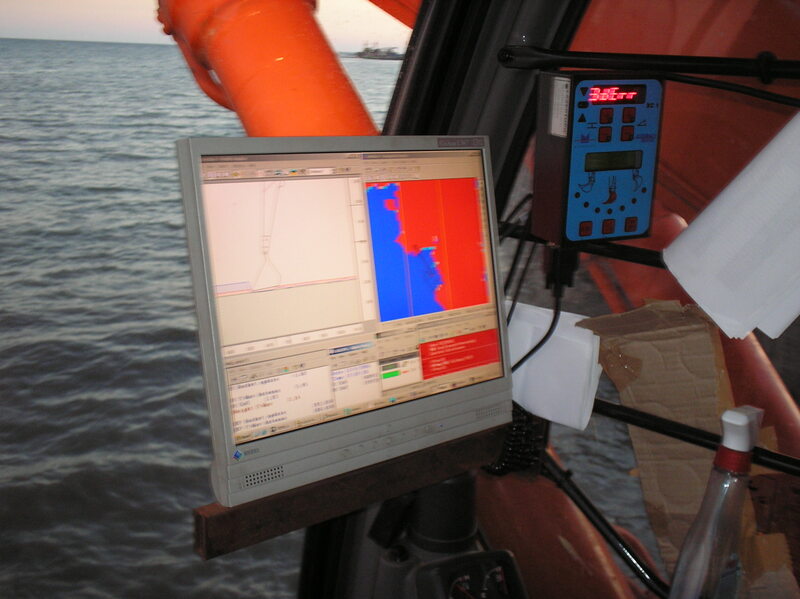 These systems enable operators to visualize the shovel bucket of the machine on a computer screen mounted in the cabin. 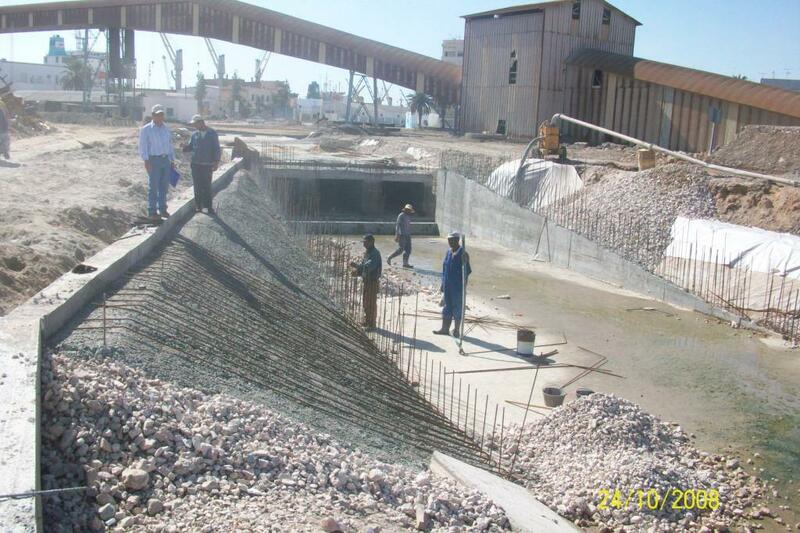 The excavated materials are placed in the barges that are routed to a temporary pier once they are filled. 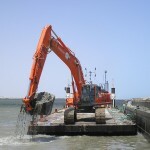 At the quay, a giant shovel with a long arm enables the transfer of materials in the dumpers. 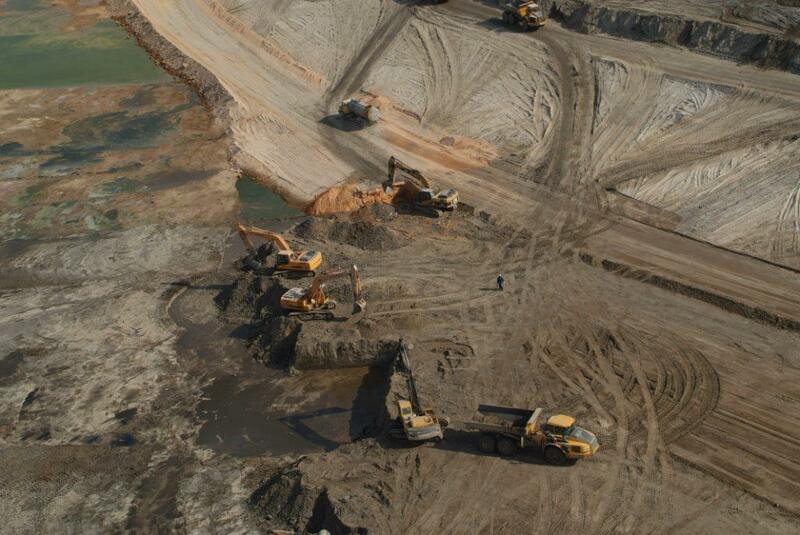 The latter carry the materials to the phosphogypsum deposit where they are drained and spread out. 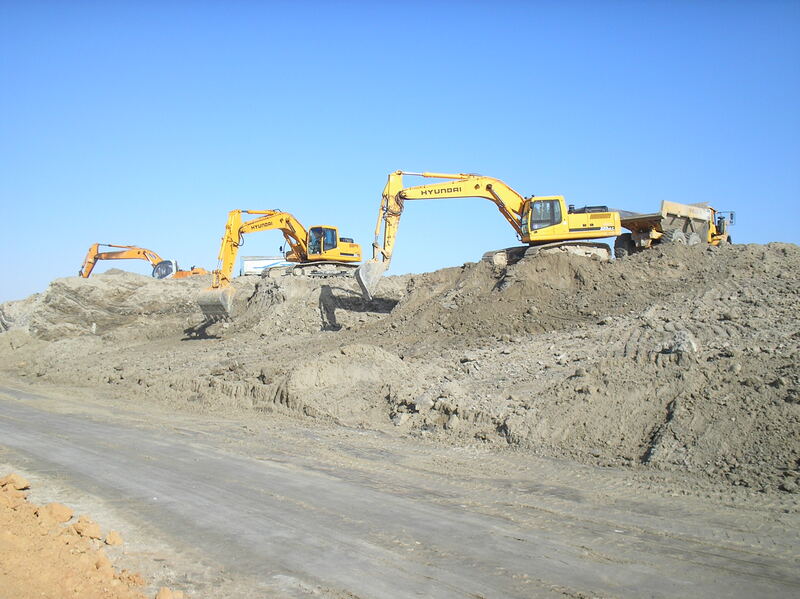 Dry excavation works are carried out ​​by SOMATRA-GET Company through the use of earth-moving engines and equipment. 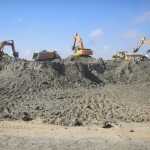 These works include the excavation of contaminated soils located within the contractual line separating the dry excavation from the underwater one. 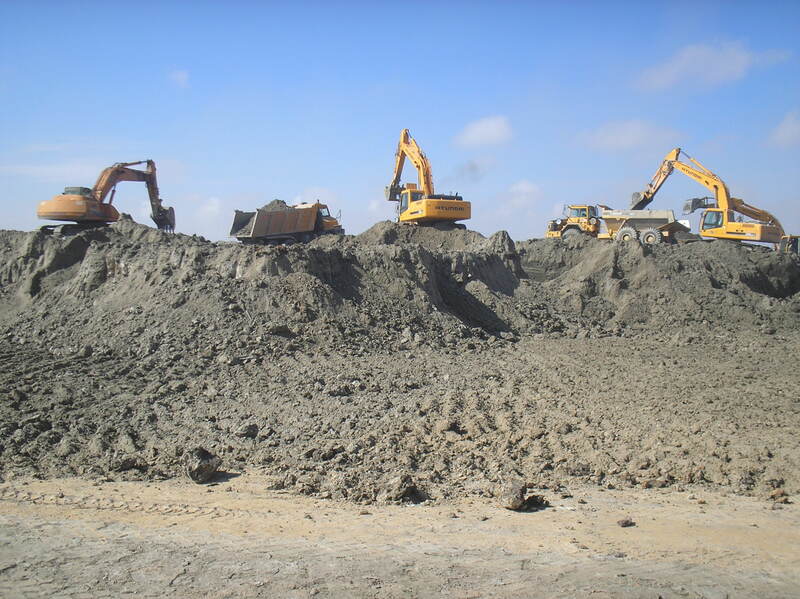 All dry excavated material of the phosphogypsum plate or of the contaminated soil of the site were taken to the phosphogypsum deposit where they were placed and deposited in successive layers. 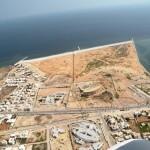 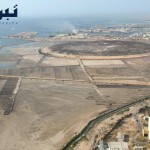 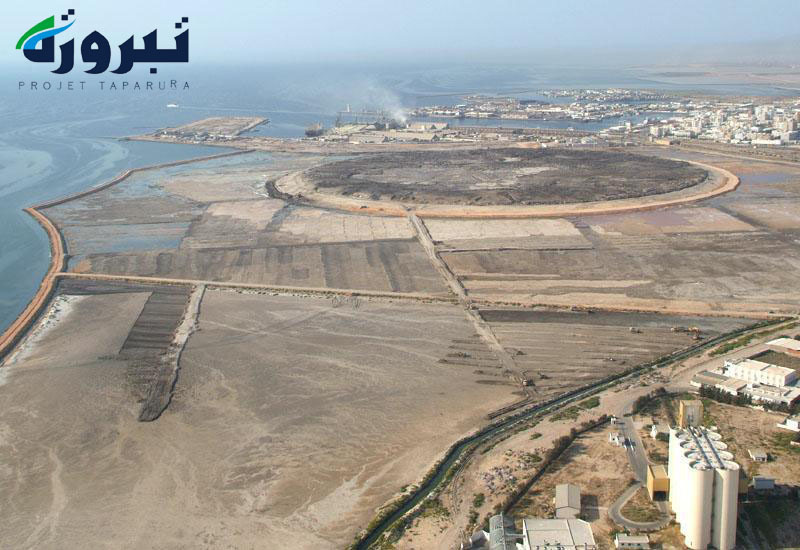 To enable the dry excavation of the above-mentioned areas and the hydraulic fill works, main breakwaters on the sea side have been constructed by the company. 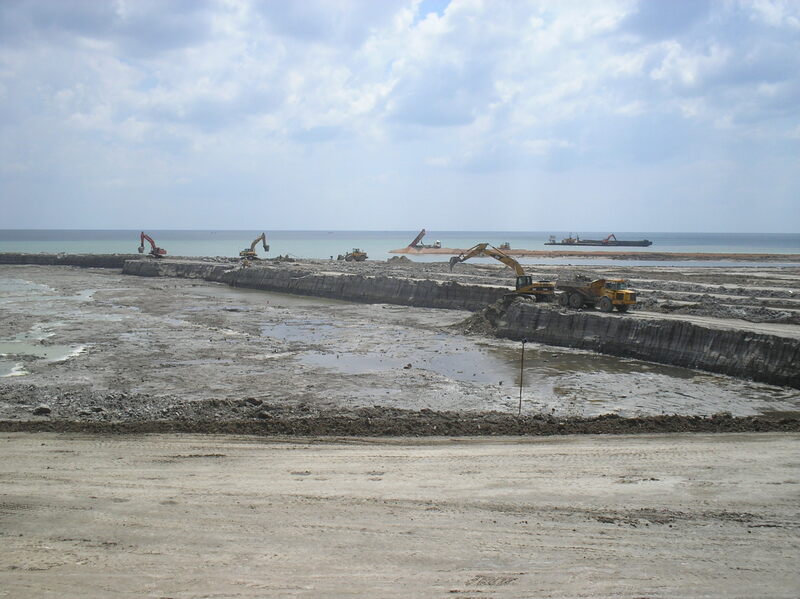 These breakwaters limit to some extent the site on the seaside and help protect the downstream area against currents and swells. 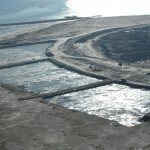 Other secondary breakwaters have also been constructed. 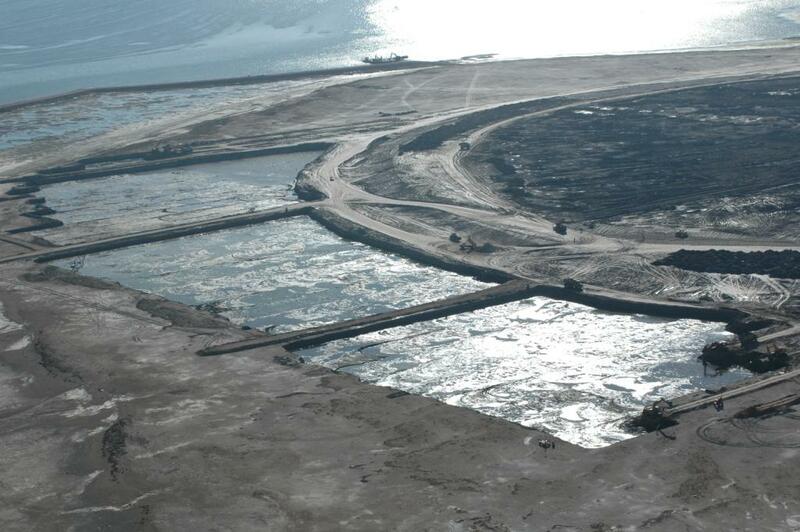 A pumping system was set up to pump the pools water behind the main breakwater towards the sea to dry them up. 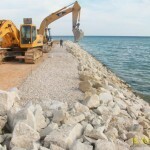 These breakwaters equally allow access to different parts of the site and facilitate the pumping in areas to be cleaned up. 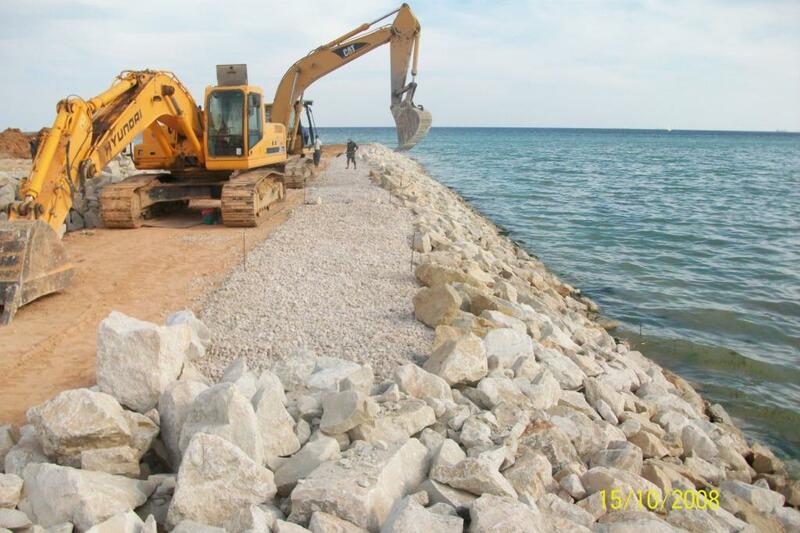 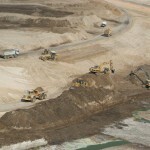 All construction works of the breakwaters are completed. 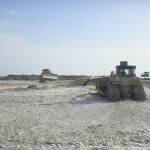 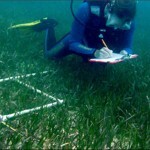 The Consortium began the work of remodeling the phosphogypsum deposit, from the second fortnight of September 2006, in the form of a cone trunk having a diameter of 880 m wide and a height of 16 m. Given the reduction in the quantities of contaminated soil, it was decided in agreement with Supervision Mission and the Technical Assistance Mission to reduce the diameter of the phosphogypsum deposit to only 810 m and to implement it in two platforms. 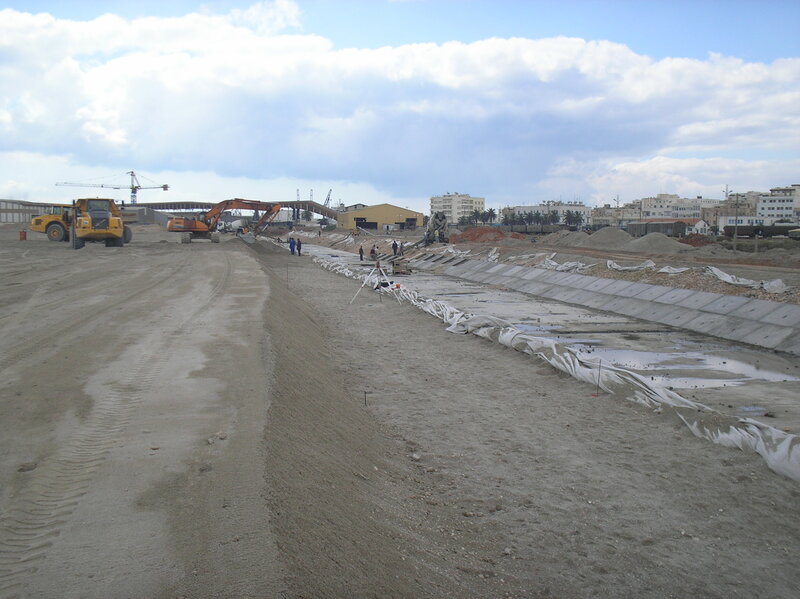 The phosphogypsum deposit and the polluted underlying soils will be isolated through the use of a waterproof barrier made ​ up of a 0.6 m-wide trench filled with a mixture of bentonite – cement in which a 3 mm-thick high-density polyethylene (HDPE) sheet is inserted. 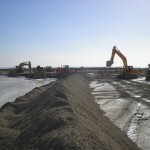 This barrier will extend from the backfill platform up to the clay layer situated at a depth of 11 to 13 m from the projected level of the ground. 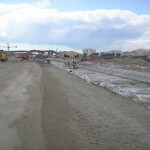 The construction of the barrier started on July 3, 2008. 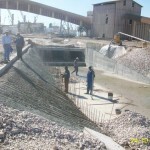 With a view to protecting the barrier and to drain the runoff to the drainage ditch, SOMATRA-GET Company started the construction works of the head of the barrier in December 2008. 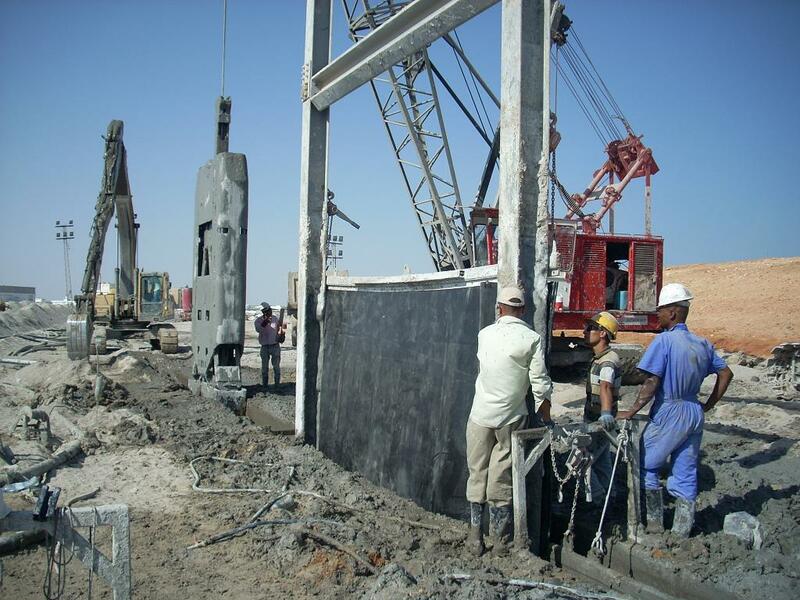 The barrier system – exhaustion system- must always maintain the level of the groundwater inside the area of the phosphogypsum deposit below the level of the groundwater outside the barrier. 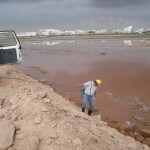 This condition is important to avoid any possibility of pollutants spreading to the outside of the barrier. 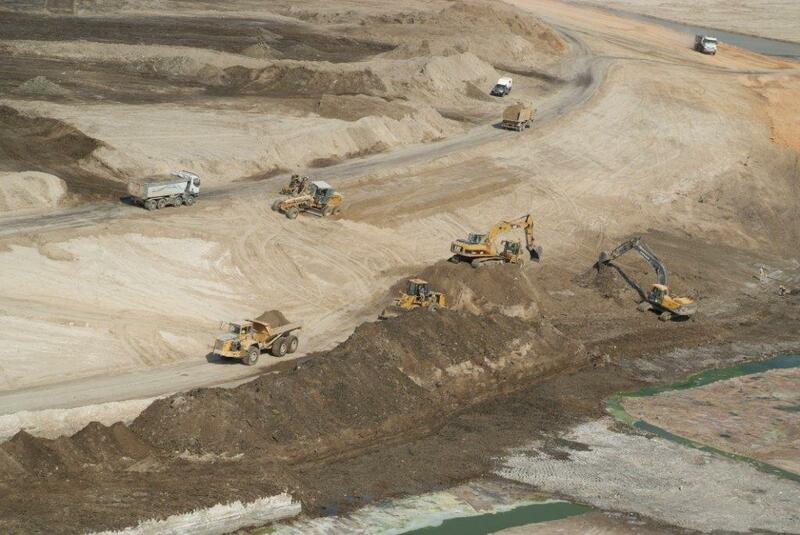 According to the current plans, the groundwater is pumped from a level located below the clay layer, which is located below the deposit. 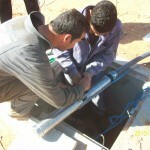 After having implemented two pumping tests, 105 geotechnical investigation drilling tests, 22 piezometers and processing of test results, the choice was to increase the number of pumping wells from 7 as indicated in the contractual plans to 10 and a drain was also to be set up around the deposit inside the barrier. 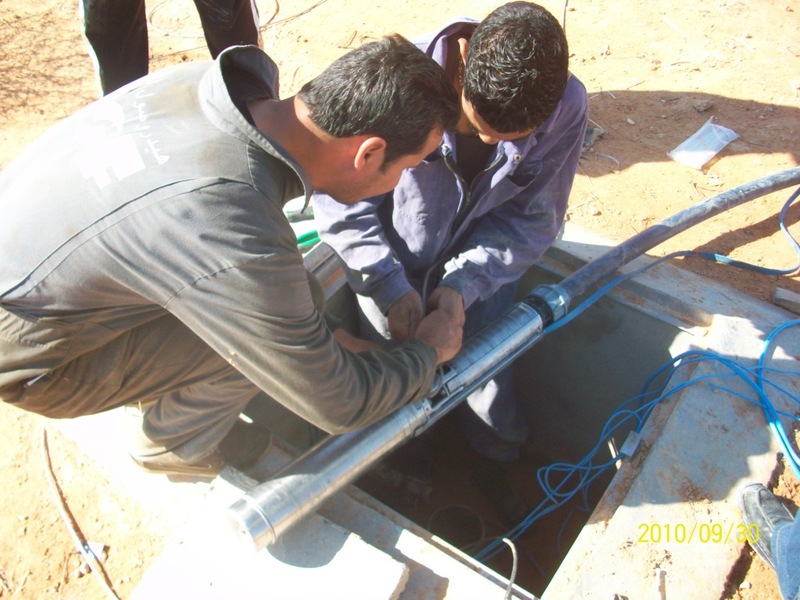 The pumping rate of the 10 wells is 5 m3 / h.
The effect of the pumping system on the groundwater is continuously monitored by 50 piezometers installed on the deposit, as well as on both sides near the barrier. 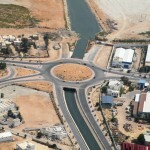 This system was not planned in the contract. 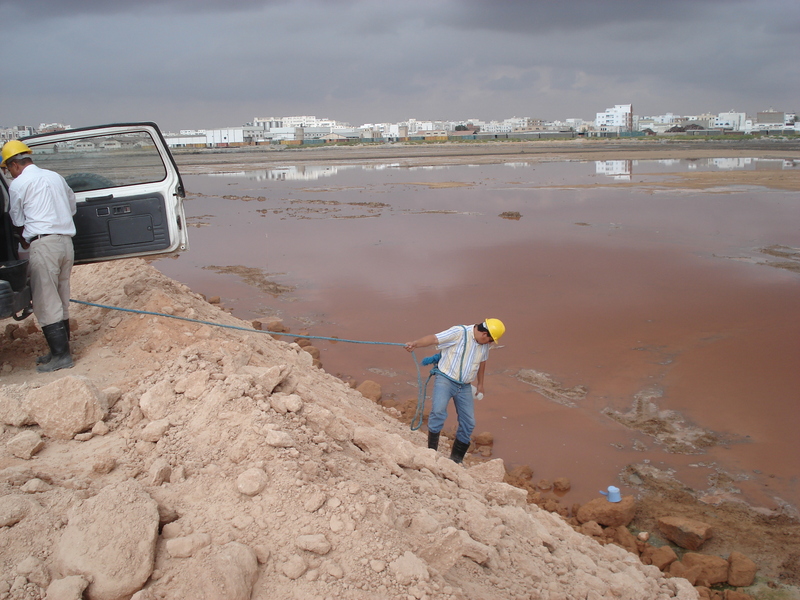 It was added following the new conditions of permeability of subsoil. 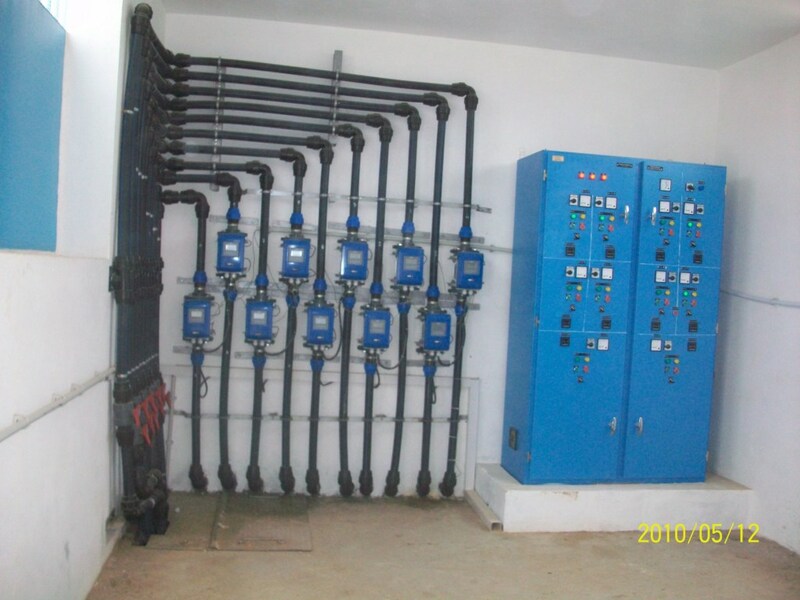 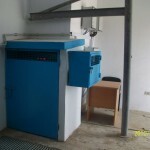 It is designed to ensure that the level of the groundwater does not exceed the level specified in the vicinity of the deposit. 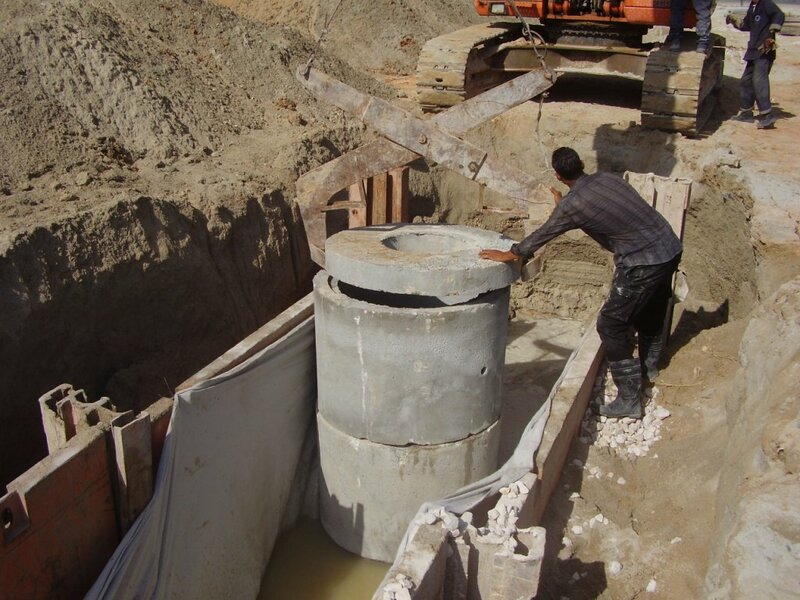 The drainage system will lead to a quicker initial lowering of the water table inside the barrier. 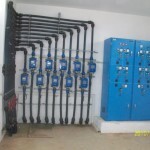 When the specified groundwater level is reached inside the entire deposit, the drainage system will catch only the runoff from exceptional rainfall for a limited period. 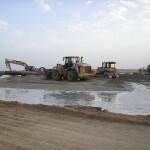 In conformity with the schedule of work progress submitted by the Consortium, the latter conducted on September 24, 2007 the hydraulic fill works to have a field to reclaim from the sea, and whose surface will be about of 380 H. The amount of sand needed for the creation of this platform is about 7 million m 3. 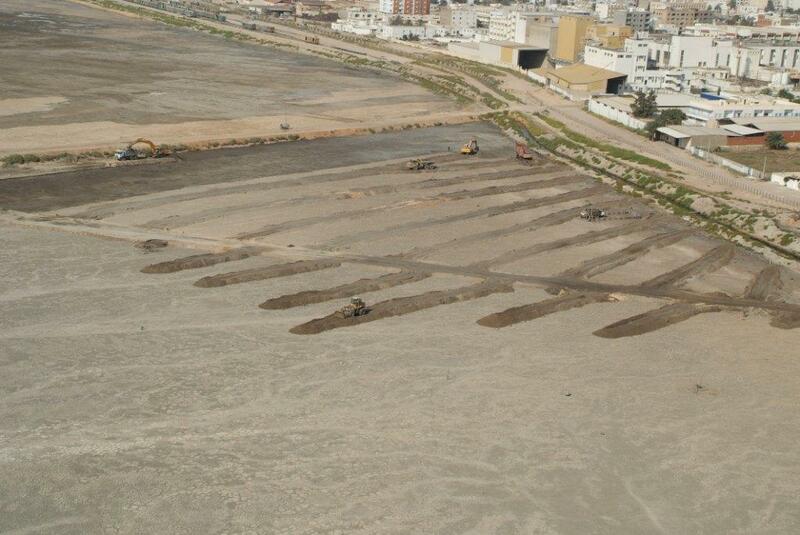 The borrowing lodging identified by the pre-project studies is located at the Canal of Kerkennah (see site location below), limited in the west by the herbarium, in the east by the Kerkennah plateau, and in the north and south by the isobaths -10m NGT. 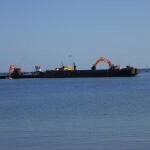 For the discharge of dredging sand, a system of floating and land delivery mains has been installed. 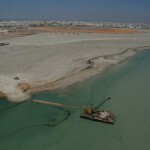 The dredge is located in the basin of the Commercial Port opposite the quay of the Tunisian Chemical Group (GCT). 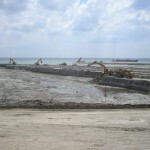 Floating pipes of Ø900 mm have been installed in the basin. 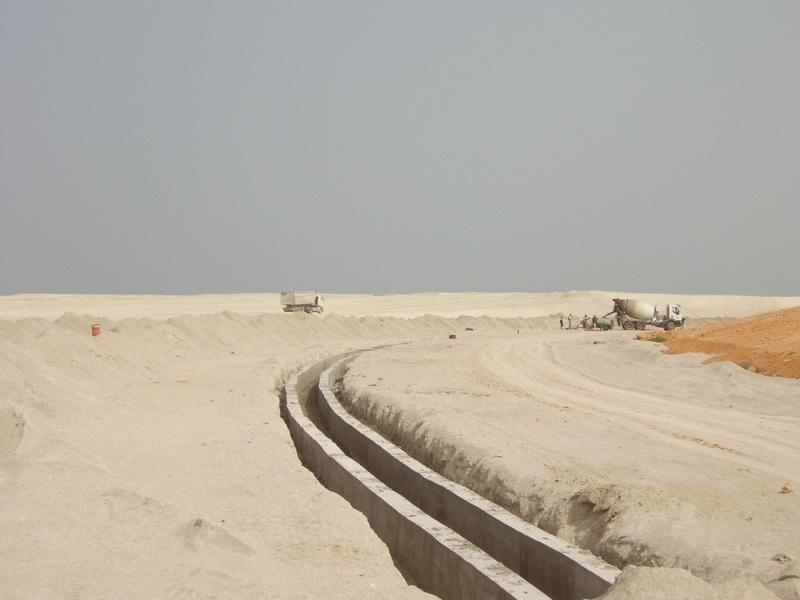 Land pipes have been installed above the railway located along the basin and under the pavement of the beach road. 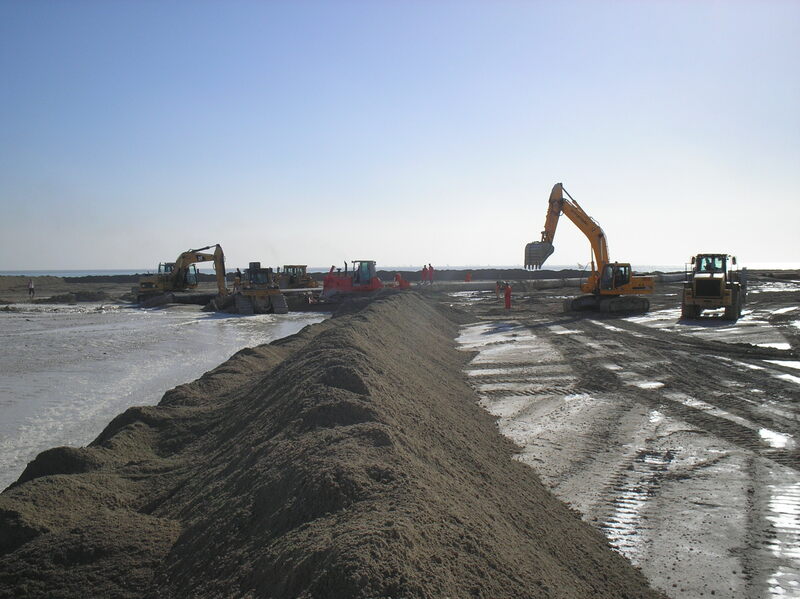 In the work site area, land pipes have been installed in order to discharge the dredged sand directly on the backfilling site. 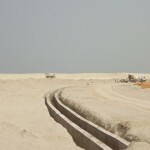 The setting up of the land pipes in the work site area will be changed as soon as the setting up of the hydraulic fill progresses. 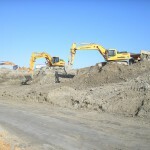 The hydraulic fill works can be considered as cycles that repeat continuously 24H/24H. 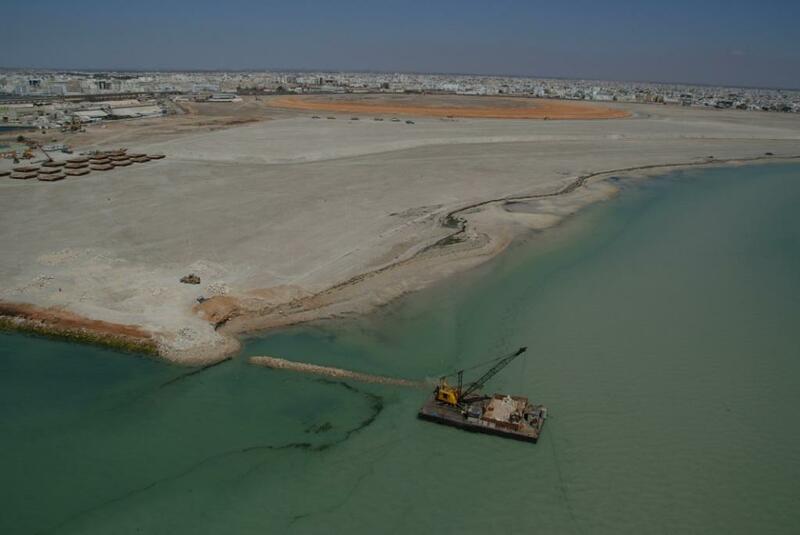 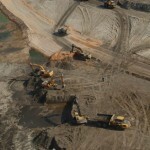 For the basins north of the backfilling, and given the importance of the discharge distance, a provisional stock of materials was placed near the dredge to transport it by land to the basins to be backfilled. 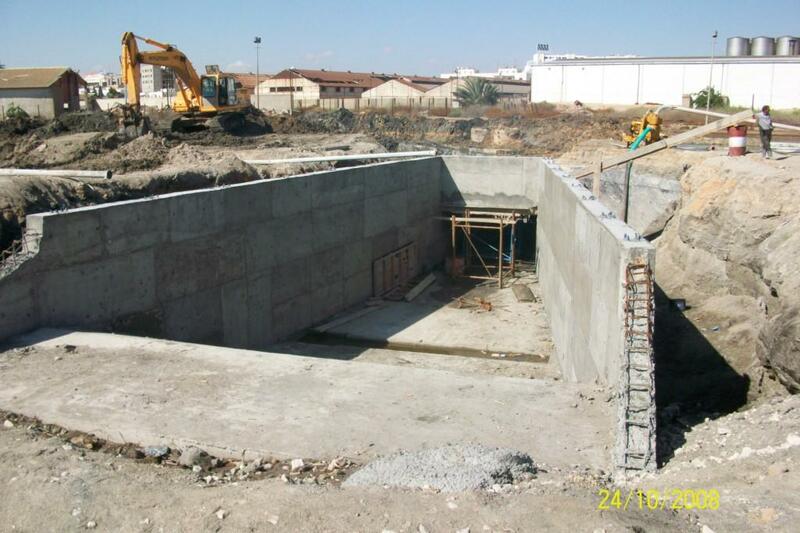 The implementation plans relating to the covered part of the drainage canal in precast culvert prepared by the Consulting company LCI, subcontractor of JES, have been approved by the Supervision Mission as well as by the Supervising Bureau Veritas. 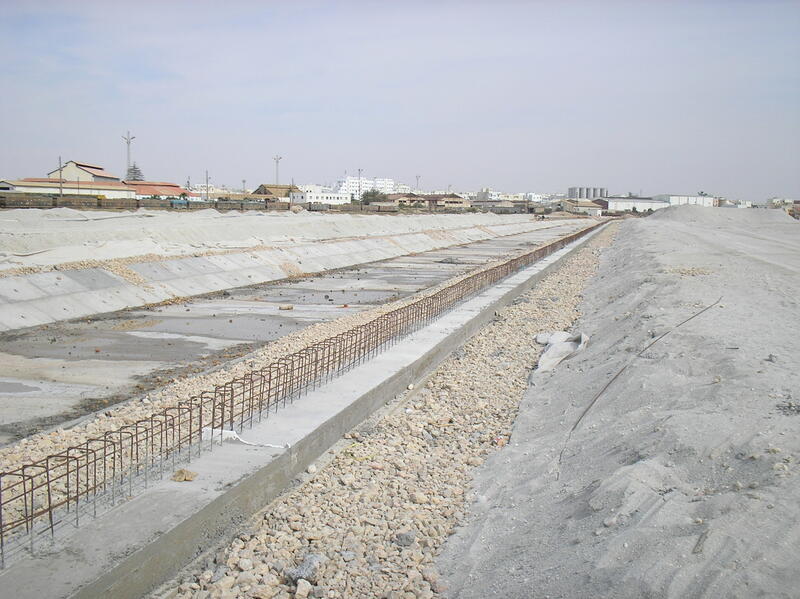 The prefabrication of culverts was conducted during the month of October 2007. 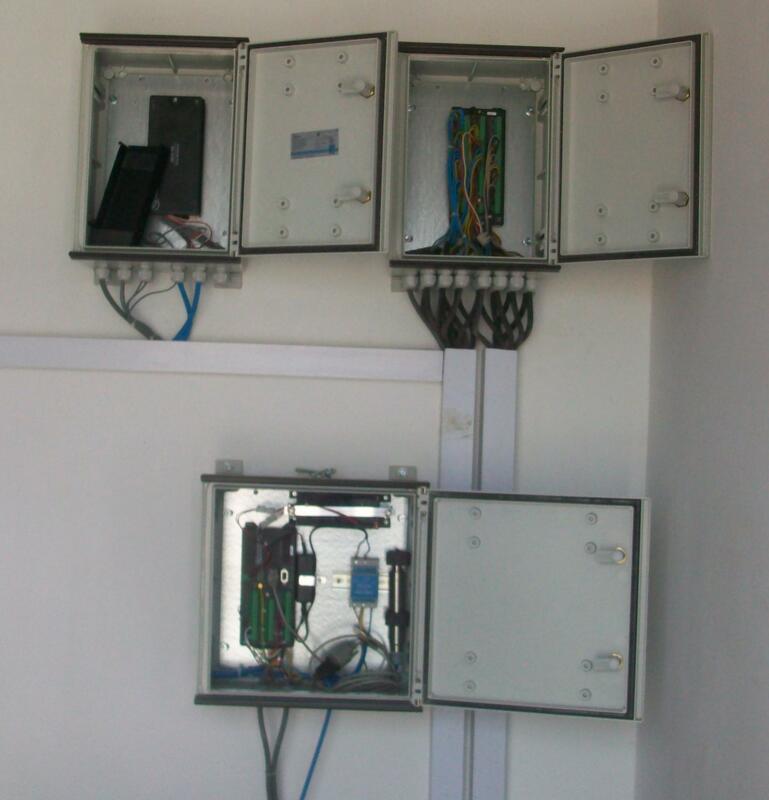 Meetings and contacts were held with the various stakeholders (SNCFT, OMMP, CPG, ONAS, SONEDE, STEG, Tunisie Telecom …) in order to ensure the required coordination with regard to the right-of-way and the deviation of networks. 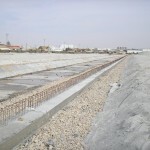 The Supervising Bureau VERITAS ensures the technical control of the covered part of this canal as part of a decennial insurance as a work under railway track. 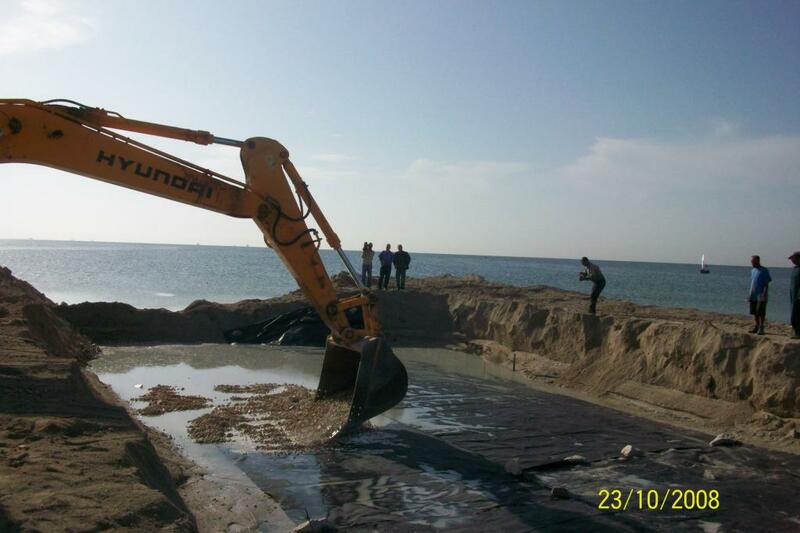 - Prevent the transported sediments which come from the North to settle on the beaches. 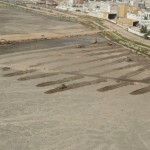 In the absence of jetties, these sediments, consisting of fine particles, lead to the silting up of the beach. 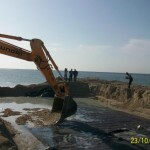 - Avoid the recovery of sand from the new coast through transport capacity, sediments halted by the jetty, thus contributing to the stability of the beach. 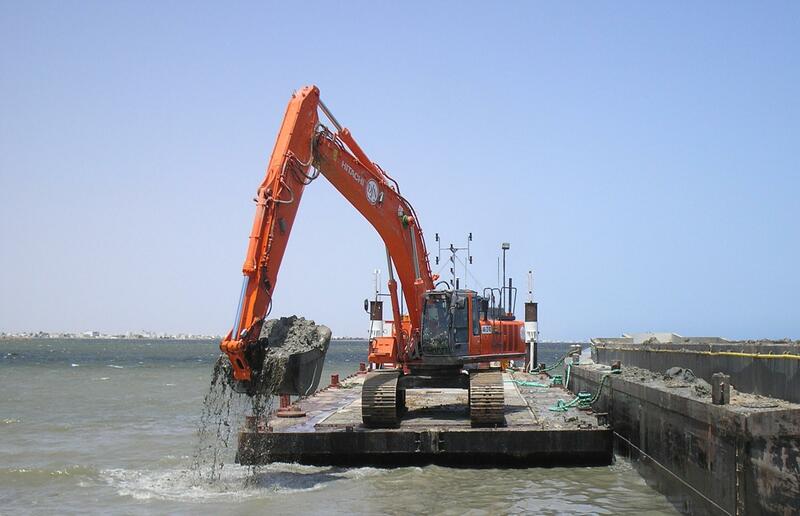 The construction works of the jetties are carried out by SOMATRA GET Company through the use of land and sea engines and equipments. 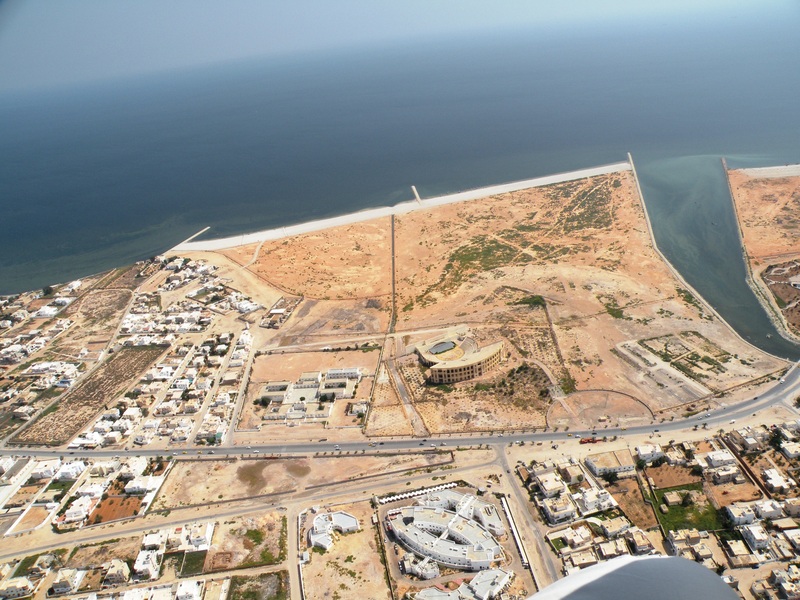 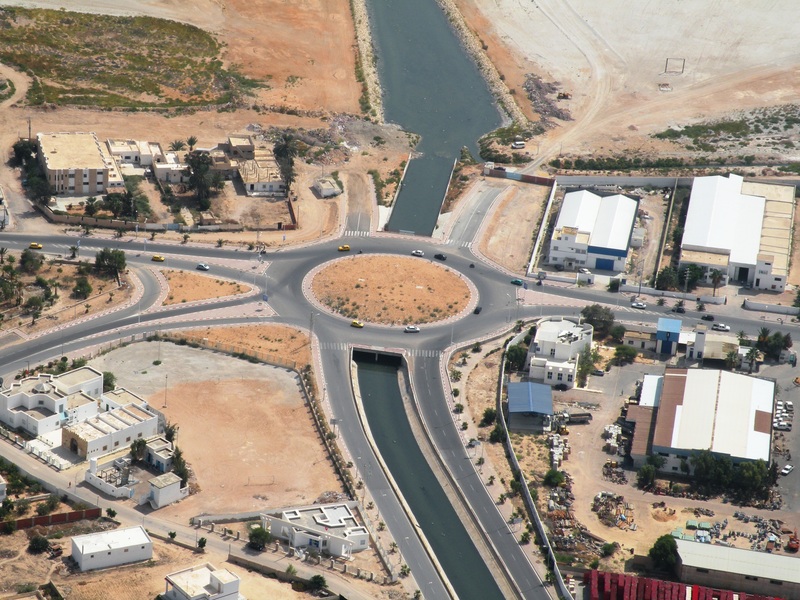 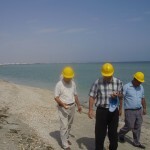 The works started in late 2007 with the setting up of seven (7) jetties along the new coast line from the Commercial Port of Sfax up to the Canal of Oued Ezzit. 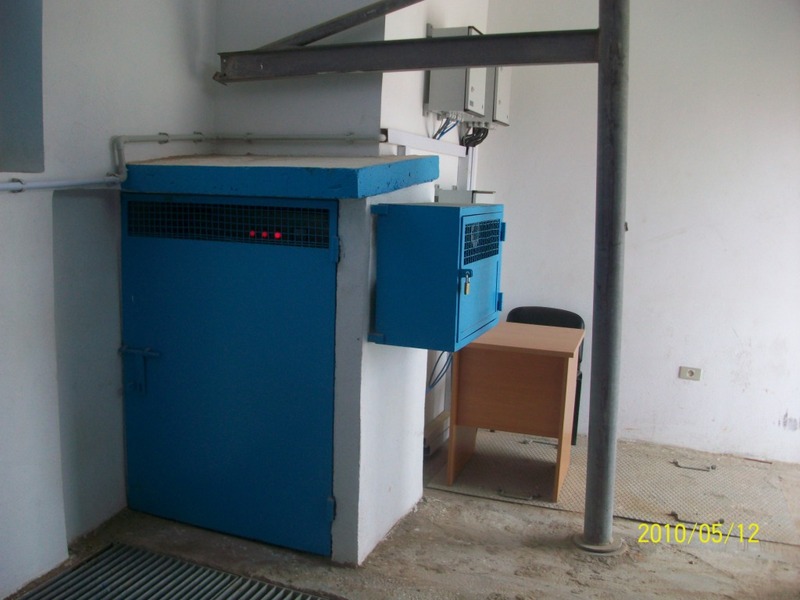 In this respect, follow-up campaigns have been conducted by two different laboratories in order to analyze the following parameters: ALCONTROL (Belgium): pH / conductivity / Arsenic / Cadmium / Chrome / Mercury / Lead / Copper / Nickel / Zinc: every two weeks. 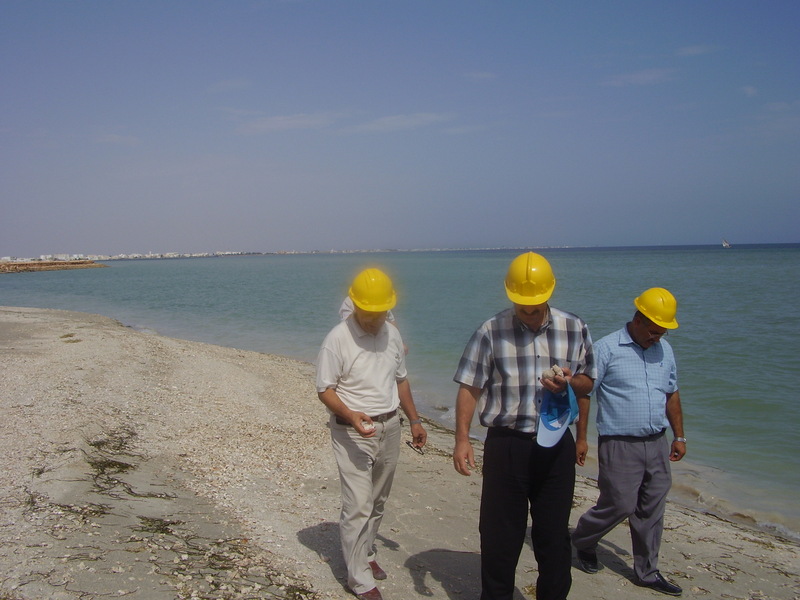 CITET (Tunisia): pH / Temperature / Conductivity / Salinity / Color / NTK / Nitrate / Phosphorus T / Chlorophyll a / Arsenic / Cadmium / Chrome / Lead / Nickel / Zinc: on a monthly basis. 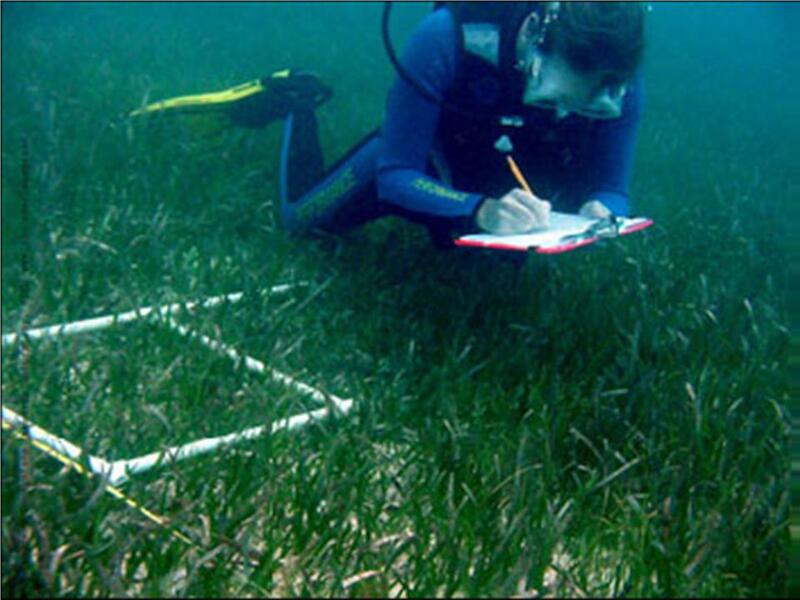 • Indication of five model areas for characterization Characterization of the vegetation and macro benthos met per quadra from 1m ² to 0.4 m².